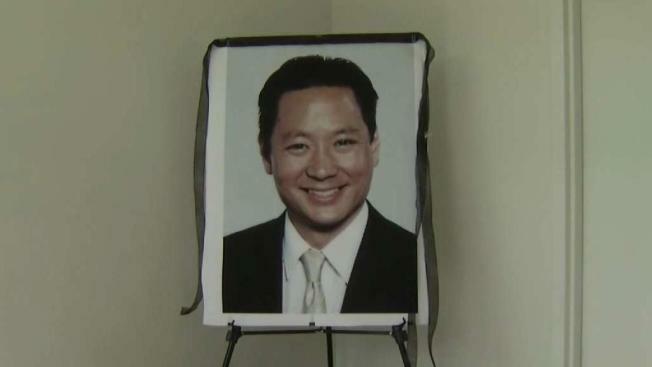 NBC Bay Area's Marianne Favro provides the latest updates in the investigation into Public Defender Jeff Adachi's death. The Medical Examiner of San Francisco and the San Francisco Police Department have opened a suspicious death investigation into Public Defender Jeff Adachi, who died Friday night at the age of 59, NBC Bay Area's Investigative Unit confirmed. Sources said Friday Adachi died from a heart attack, but the Investigative Unit learned Saturday that a police report said officers were called to a residence on Telegraph Place to meet with the medical examiner about the discovery of Adachi's body. While officers headed to the scene, the medical examiner called dispatch to cancel the officers from responding. SFPD kept going and were told a woman had called 911 from Adachi's phone, which has since gone missing. According to police, the woman reported she and Adachi went to dinner when Adachi complained about stomach pains. The two headed to the nearby apartment that reportedly belonged to a friend of Adachi. The woman told police he had two glasses of wine, took a pill, then became unresponsive. Paramedics took Adachi to the California Pacific Medical Center Davies Campus where he was pronounced dead, the report read. Sources told the Investigative Unit that the autopsy for Adachi was being conducted Sunday. Meanwhile, the Investigative Unit learned that investigators went back to the place where Adachi was found unresponsive with a search warrant early Sunday morning. Investigators are also trying to speak with a second woman in connection with the case, the Investigative Unit has learned. Adachi served as public defender since 2002 and spent more than 30 years as part of that office. "I am saddened to announce that San Francisco Public Defender Jeff Adachi passed away tonight," tweeted Mayor London Breed. "San Francisco has lost a dedicated public servant, and our communities have lost a champion." Breed added: "Jeff always stood up for those who didn’t have a voice, have been ignored and overlooked, and who needed a real champion. He was committed not only to the fight for justice in the courtroom, but he was also a relentless advocate for criminal justice reform. Jeff lead the way on progressive policy reforms, including reducing recidivism, ending cash bail, and standing up for undocumented and unrepresented children." Adachi was the only public defender elected in the state and had just been sworn in for his fifth term. "We do not yet have solid details as to the cause of his death, but we do know that he was out in North Beach at dinner with a friend when he began to have trouble breathing," a statement from the Public Defenders office said. "EMTs were able to recover a pulse but he later died at the hospital. He is survived by his beautiful wife Mutsuko and his daughter Lauren." Oakland Mayor Libby Schaaf also commented on Adachi's death tweeting, "Jeff Adachi fought for truth and justice - values that speak to all of us. Although based in SF, Jeff's moral leadership helped frame a Bay Area ethos. I will miss him as a friend, and a colleague in the fight for a more just and compassionate government." Adachi oversaw the work of more than 100 lawyers as his office represented more than 20,000 people a year charged with misdemeanor and felony charges. He served as the public defender in the Kate Steinle case in which a Mexican man was acquitted of murder in the shooting death of a San Francisco woman, sparking a national immigration debate. Steinle's death put San Francisco's "sanctuary city" policy in the spotlight, as Democrats and Republicans lashed out at city officials for refusing to cooperate with federal deportation efforts. During the presidential race, then-candidate Donald Trump cited the killing as a reason to toughen U.S. immigration policies. But the politics of immigration were not allowed to come up in the monthlong trial. Adachi, a graduate of UC Berkeley, was also into independent filmmaking and was rasing money to complete a documentary on the Steinle trial and the international debate over immigration policy. Deeply saddened tonight to learn of the passing of Jeff Adachi. Our condolences to his family, his friends and colleagues in the @sfdefender office. Jeff Adachi fought for truth and justice - values that speak to all of us. Although based in SF, Jeff's moral leadership helped frame a Bay Area ethos. I will miss him as a friend, and a colleague in the fight for a more just and compassionate government.